Well I'll break all those rules now by pointing out my extreme distaste for a series of ads being run by the international fund for animal welfare (IFAW). You can see the ads at stopthesealhunt.ca which basically attempt to use guilt and self perceived shallowness to make people act. Let's put aside the actual question of whether or not hunting seals is immoral or wrong. The point I want to make is that these ads are based on the idea that somehow local/personal concerns should be trumped by global concerns. That any problems that we have in our day to day lives do not justify anger or action because there are bigger problems in the world we should be solving. If we as humans actually worked like this we'd be frozen by indecision in simply trying to prioritize our actions in the global context. I believe we just do not work like that. We must continue to act locally, as our communities and our daily interactions with each other are the foundation for everything else we can accomplish. Trivializing one issue because a larger one exists does not nullify the original issue. The bus is late, ok fine that's a problem. 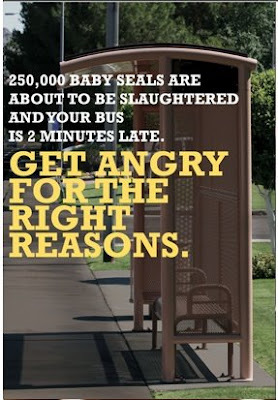 Seals are dying, that is a problem. People are starving, that is a problem. 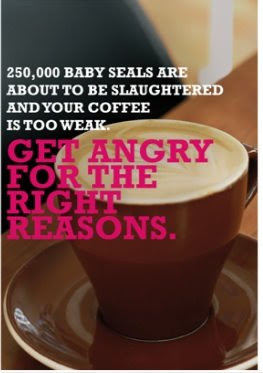 Apparently by IFAW's logic we would be selfish fools to worry about dying seals knowing that humans are dying. Anyway, the point is that these issues are not mutually exclusive. I think cruelty to animals is important, but I'm offended when this type of marketing uses negative appeals to our emotions with flawed logic.